How Do You Want To Be When You’re Old? My grandmother, Shirley Bernstein, bottom right, and the “girls” – her table-mates. Old, I have discovered lately, is a state of mind. Look at these ladies here. The one on the far right next to the empty chair is my grandmother. 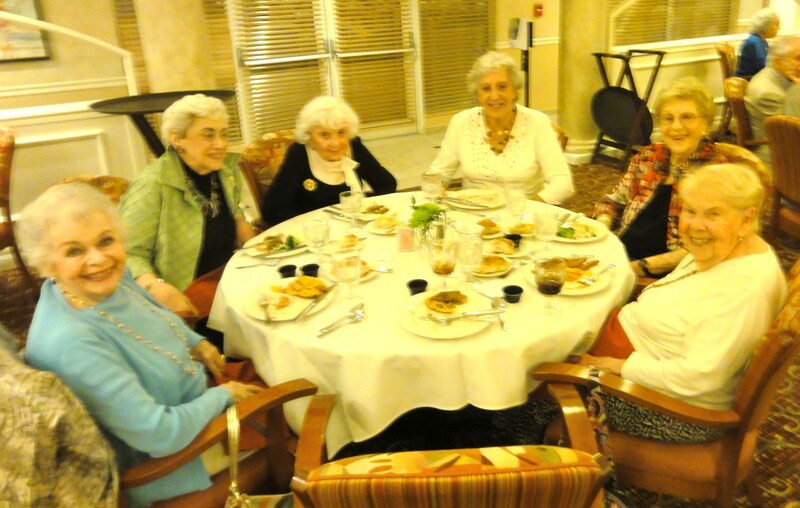 She’s ninety and these are her buddies – her table-mates at the independent living establishment where they reside. A few weeks ago I had the privilege of dining with them, and what an experience it was! All of them are over eighty and living on their own in an apartment in the building. They have dinner together in the building’s dining room nightly. But it’s not just a cafeteria; this is a place where you’re required to dress for dinner. No schlumpy jeans and t-shirt for this dining room. Every night they dine on soup, salad, entree and desert. And the apartments are regular apartments that anyone might live in. My grandmother’s is a one-bedroom, one-and-a-half bathroom unit on the third floor. It’s lovely and perfect for her. She has someone in to clean, but she does most of her own laundry and gets herself meals other than dinner. The dining room is open Wednesday through Sunday for lunch, so sometimes she lunches there, but mostly it’s just dinner. I was visiting to give a speech that night about my experiences as an expat in Tokyo. The place has a great auditorium and I was able to connect my laptop to the projector and give a Powerpoint presentation like at any other lecture hall I’ve attended. The lecture was at 8pm, after dinner, and I didn’t know really what to expect, but there was a pretty good turnout – 40 or 50 people there. But really, I learned more from these six women before the speech that evening than I could ever have presented to them. Over dinner, these women acted just like me and my thirty and forty-something girlfriends. They complained about men, they discussed fashion and shopping, and there were two condom jokes told, making us all roar in laughter. I must admit that heads at other tables turned toward us to wonder why we were laughing so much and so hard! This is just how I want to be when I get to be ninety, I decided. All of them play either mah jong or bridge weekly. They are active in local women’s organizations, and some of them, including my grandmother, volunteer in a local elementary school. They care about their hair and makeup and clothing like anyone else. They demand to be taken seriously, as well they should. Each one of them is a formidable force in her own right with a good brain and thoughtful ideas. So some of them, also including my grandmother, use a walker to keep them steady or take a catnap in the afternoon to refresh them. They are all making the most of the opportunities afforded them at this time in their lives. Of course it’s different and life is different for them now than it was twenty years ago, but truly, which one of us is the same as she was twenty years ago? My grandmother, as I’ve mentioned before, has been my best friend for all of my forty-something years, and there are very few days that I don’t speak to her on the phone even though we live thousands and thousands of miles apart. Somehow we both make the effort to keep our bond close and I don’t take it for granted. I know how lucky I am to have her in my life. She’s the person who taught me to always strive to be my best self and for that, I am grateful. I plan to be happy and forward-thinking well into my nineties, or as long as my health will allow me. These ladies know the meaning of a life well-lived, and they continue living it with great gusto. They’re my heroes and I love them all.